Polish! Italian! Slovenian! Hungarian! Breakfast! Turkey! How many sausages are there in the world? A Sausage can be made from almost anything! 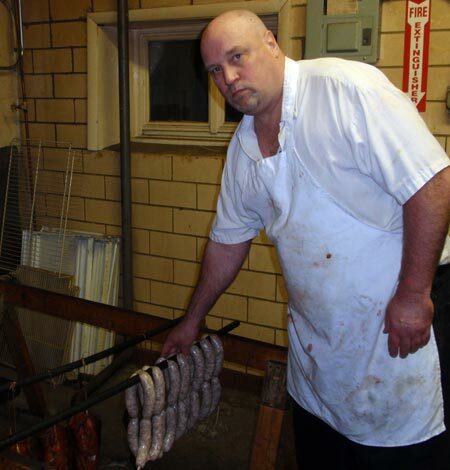 At Old World Meats, we make sausage the old fashioned way. First, the meat is ground up and the spices are added and mixed in. Next, the meat is stuffed into casings. We use natural hog casings for our sausage. Lamb casings are used for smaller sausages such as breakfast sausage. Our traditional favorites come in two varieties - Fresh or Smoked. So what's the difference? Fresh sausages are just what they sound like. Fresh ground meat, usually pork is mixed with a certain recipe of spices to get that special flavor. For example: Fresh Kielbasa and Slovenian sausage are made with ground pork adding salt, pepper and garlic among other spices. Both have a great garlic taste. Hot Hungarian looks redder because Paprika is one of the main ingredients. Italian sausage has fennel seed and other favorite Italians spices-the hot variety has crushed red pepper added. 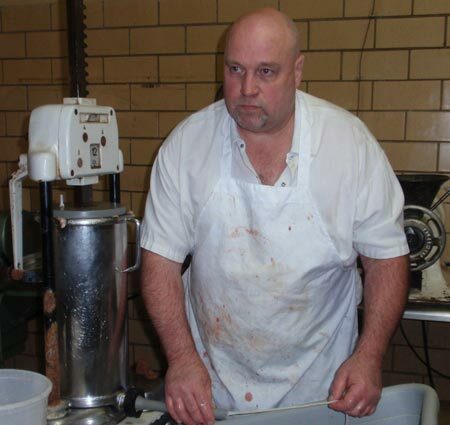 If you like it hot, ask your butcher to kick it up for you. Because fresh sausages contain raw pork, be sure to boil them for at least 20 minutes to ensure the meat is thoroughly cooked. Smoked sausages are made the same way as the fresh, except they have curing salt added. These sausages then hang to cure for 1 day, and then are put into the smokehouse. There they stay for half a day to absorb the natural smoked flavor. Smoking preserves the meat naturally and extends the shelf life by weeks. You can just heat and eat. Watch Ed Jesse make sausage and then Sharon Jesse shows the different types of sausage. So what's your favorite sausage?